UN’s envoy to Syria, Staffan de Mistura, says Syria could see the return of ISIS if there is no inclusive peace settlement. 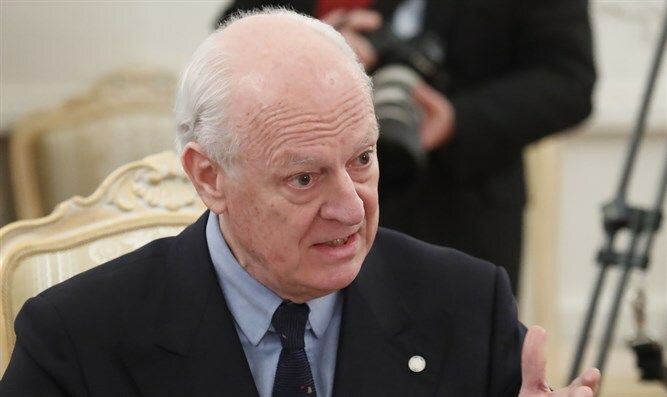 The UN’s envoy to Syria, Staffan de Mistura, warned on Monday that Syria is heading for a catastrophic partition and could see the return of Islamic State (ISIS) if there is no inclusive peace settlement. “The truth is that a soft, long-term partition of Syria, which (is) the one that we are witnessing at the moment, in different areas of control, will be a catastrophe, not only for Syria but for the whole region,” he told an audience at Geneva’s Graduate Institute, according to Reuters. “Without an inclusive political process, including those who are excluded, particularly the majority, the Sunnis, Daesh will come back,” he warned, using the Arabic acronym for ISIS. He said he believed neither the European Union nor the World Bank would help fund the estimated $352 billion cost of rebuilding Syria unless there was a political process with a new constitution, elections under UN supervision and power-sharing. Without that any military victory would be a pyrrhic victory, added de Mistura. ISIS swept across Syria and Iraq in 2014, declaring a cross-border "caliphate" in territory roughly the size of Britain, attracting thousands of foreign fighters. The jihadists suffered a series of stunningly quick defeats last year, including the loss of their de facto capital Raqqa in Syria. De Mistura said on Monday that Russia and the United States had a common interest in seeing ISIS defeated and were talking to each other, which was positive. An agreement between those two countries to sit down and talk would have an immediate impact across the region, he added. Russia is a strong supporter of Syrian President Bashar Al-Assad while the U.S. backs the moderate rebels trying to oust him.